Aftershocks and political fallout from the Interpolar War and the destruction of Peace River have left Terra Nova reeling. With Earth identified as the culprit, Terra Nova's governments have resolved to never to be caught off guard again and the Black Talon program was formed for the purpose of being sent off planet to recon Earth's former colony worlds. Their first mission is the gate world Caprice, with its orbital fleet yards that were the staging grounds for the first attack on Terra Nova. They have the training and equipment with which to observe and sabotage Earth's Colonial Expeditionary Force (CEF) wherever opportunities arise and gain new allies whenever possible. * A continued timeline covering from where Locked & Loaded left off to the beginning of the Battle for Terra Nova. * Newly re-organized Datacards for all variants to date, for easier play. Printed versions of this ebook are available via the Dream Pod 9 website, www.dp9.com, for $45.00 (Full Color DP9-9034c) or $25,00 (Black & White, DP9-9034). 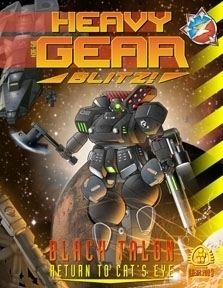 This eBook now also includes a free copy of the new Heavy Gear Blitz! Field Manual (DP9-9997) eBook as part of the downloads. The Field Manual is a compilation of the popular Gear UP eZine fieldtest rules which have been integrated into the Heavy Gear Blitz ruleset for quick play and expanded ranges. Easy to reference flowcharts, updated datacards, and new options takes this offical update to the Heavy Gear Blitz rules to a whole new level. This title was added to our catalog on May 07, 2009.